This weekend I headed up to Oakington near Cambridge to visit some friends. Arriving into Cambridge Railway Station, Cambridge seemed to be getting more like an extension of London every time I visit, especially with the volumes of people. I used my Ninebot One to make the return journey from Cambridge Railway Station to Oakington, making use of the sealed track next to the guided bus way. We headed back into Cambride in the afternoon to the Mill Pond which was a favourite hangout during the summers in my youth. I headed back to London on Sunday afternoon. This weekend I headed back to Cambridge to spend Saturday night on the bank of Burwell Lode. 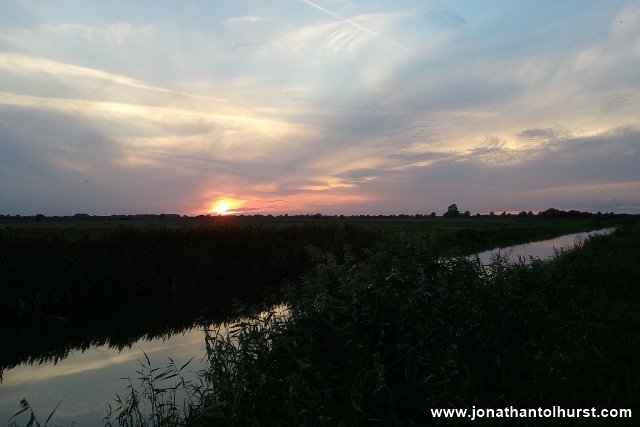 It had been over ten years since I last visited the spot and the fenland sunset had not lost any of it’s magic. This weekend I headed back to Cambridge in order to catch up with some old friends. Arriving in the early afternoon on Friday I walked from the railway station down into the city centre where I spent some time sussing out what had changed since my last visit. In the evening I took the bus over to Bottisham where I attended a dinner party at Al and Mo’s house. On Saturday we headed over to Oakington to spend some time with Chris, Moyna and their chickens. Chris and I also cycled along the unfinished ‘guided bus way’ that runs along the old railway line – an expensive white elephant if ever I saw one. Sunday night saw the drinks flowing in to the early hours. On Sunday we lunched down at the local before I caught the train out of Cambridge and back to Swindon. A wonderful weekend after a busy week of work.